"Best tender and juicy pot roast you've ever eaten! Also great sliced up and served on hearty rolls." 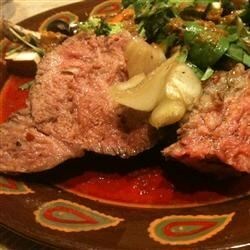 Place beef chuck roast into a slow cooker and scatter onion quarters around the meat. Pour the beef broth over the meat and sprinkle the au jus mix, Italian salad dressing mix, salt, and black pepper over the roast. Cover cooker, set on Low, and cook until meat is very tender, 6 to 8 hours. If the recipe calls for a chuck roast, then show that in the photo. The cut of beef shown is clearly no chuck roast i have ever used. I also add garlic and Kitchen Bouquet with a mixture of Wondra flour and water for gravy. Superb! Wonderful recipe. I added one 10 oz can of low sodium stewed tomatoes and 1/4 cup of banana peppers. Cooked on low for 8 hours.